If you are unable to purchase Alhambra tickets because they have sold out, another possibility is to buy a GRANADA CARD (BONO TURÍSTICO). This includes entrance to the Alhambra and is almost always available, even when the Alhambra itself has sold out. 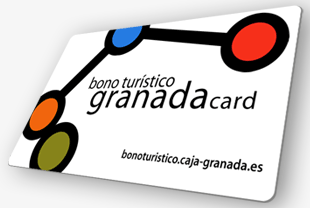 The GRANADA CARD is a particularly good idea if you are staying in Granada for several days and want to visit monuments in Granada. The GRANADA CARD is valid for 5 days. When you buy your GRANADACARD, it is possible to pay a 2.50 euro supplement to cover cancellations. However, you need to provide documentary proof and refunds are not always given. Children under the age of 2 are free but it is necessary to collect a pass from the ticket office at the Alhambra at least an hour before the time you are scheduled to visit the Nazrid Palaces. You can buy your GRANADA CARD ONLINE. You should then print the confirmation or open the confirmation on your smartphone. You can print the GRANADACARD confirmation or download the confirmation on your smartphone. You must collect a BUS PASS from the bus ticket vending machines by the cathedral on the Gran Vía. You will need to enter the LOC BUS code in the confirmation. You must collect a tourist train ticket from the GRANADA CITY TOUR OFFICE at Carrera del Darro 3A.